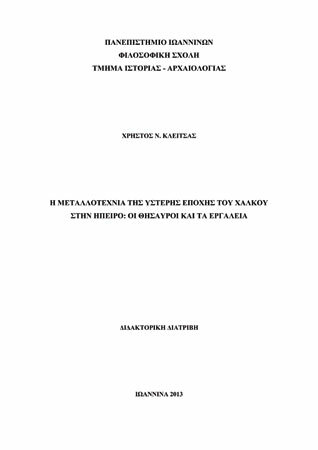 This thesis examines the metalworking of the Late Bronze Age (ca. 1600-1000 BC) in Epirus through the study of bronze tools and bronze weapons, as well as the three small hoards of bronze objects (Stefani in Preveza, Katamachi and Rodotopi in Ioannina). The prehistoric bronze objects of Epirus derive from graves (burial gifts) and hoards (functional products or raw material), from Dodona (probably votive offerings) or consist individual finds without safe archaeological context. Typologically axes (double-edged, shaft-hole or trunnion axes), several smaller categories of bronze tools (chisels, knives, anvils) and weapons (swords-daggers, spearheads) are included. Macroscopic observation (traces of casting, forging, decoration, marking, use-wear) and metallographic examination by optical microscopy (defining structural phases, hot/cold forging, hardness) aim to decode the final stages of the manufacturing procedure. Moreover, the potentials of the scanning electron microscope (SEM) and the analysis with the method of energy dispersive X-ray fluorescence (EDXRF) are utilized to investigate the chemical composition of the objects. The lead isotope analysis by multiple collector inductively coupled plasma mass spectrometry (MC-ICP-MS) on the possible origin of copper include far enough theoretical problems and are accepted with skepticism. The hard geophysical environment and the corresponding lifestyle shape through time introversion and self-sufficiency of material culture or the economic orientation of Epirus. The quantity of bronze tools and weapons impresses against the volume of local handmade pottery production and consumption. Their typology justifies the location and the prehistoric identity of Epirus between the periphery of the Mycenaean world and the Balkans. Neither copper ores exist in Epirus, nor are any direct-primary indications for the practice of local metalworking activities yet known. However, the typological and quantitative-qualitative characteristics of the manufacturing technology may substantiate common laboratory circles in the closer and wider region of Epirus. It remains for future systematic interdisciplinary research to substantiate with new finds on the availability of local metalworking activity.